Sometimes during the winter last year I bought a Japanese Kabocha pumpkin to cook and buried the seeds and rinds in my raised bed to compost. The seeds germinated and gave me 2 seedlings mid-spring. 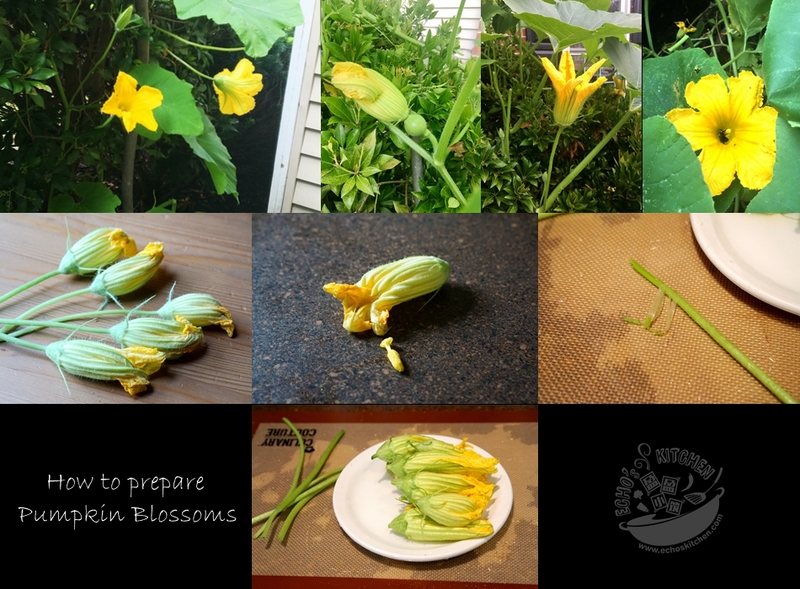 I transplanted one of them in my front yard and was doing really well, the plant began to bloom around the end of June/early July with only male flowers, when the female flowers finally showed up (flowers with tiny fruits attached below the flowers), the pumpkin was officially in full bloom. When one pumpkin plant was about to take over my entire front yard, I had to start trimming some shots and leaves to make it manageable. 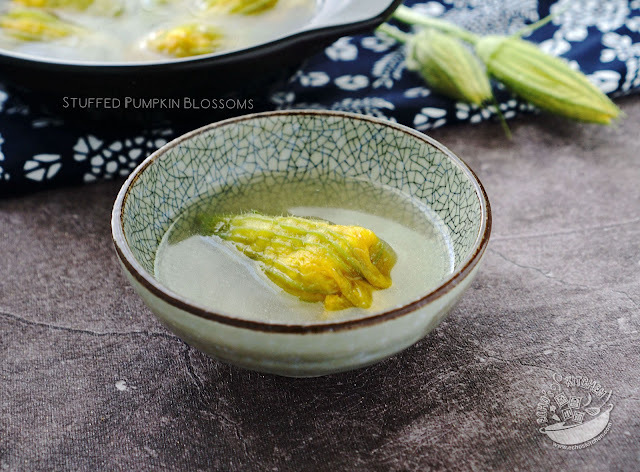 With that, I also harvest some male blossoms to make this stuffed pumpkin blossoms soup. Pumpkins have separate male and female flowers, with the male flowers appearing first early summer. One or two weeks after they appear, female flowers form and begin to open. Pollen from the male flowers has get to the stigma of the female flowers to set fruit. Since I am only harvesting male flowers for cooking, I normally do it after 11:00 am, allowing bees to have plenty of time to pollinate the flowers. 1. To prepare the blossoms, gently remove the pistil from each flower. Remove the hairy tougher skin of stems，cut stems to about 2 inches. Rinse to make sure no bugs/dust is in the blossoms, let dry. 2. Place minced meat in a bowl, add 2-3 tbsp of Chopped Scallion/Spring onion, 1/2 tsp of salt ,1/2 tsp of Chinese cooking wine (ShaoXing wine),1/4 tsp of Roasted Sesame oil, 1/4 tsp of Ginger garlic paste, a few drops of Nam Pla/Fish Sauce and a pinch of pepper powder, mix well and let the meat marinate for 20 minutes. 3. Take a half piece of soft tofu, press to mash the tofu using a cleaver or a pastry scrapper to paste. 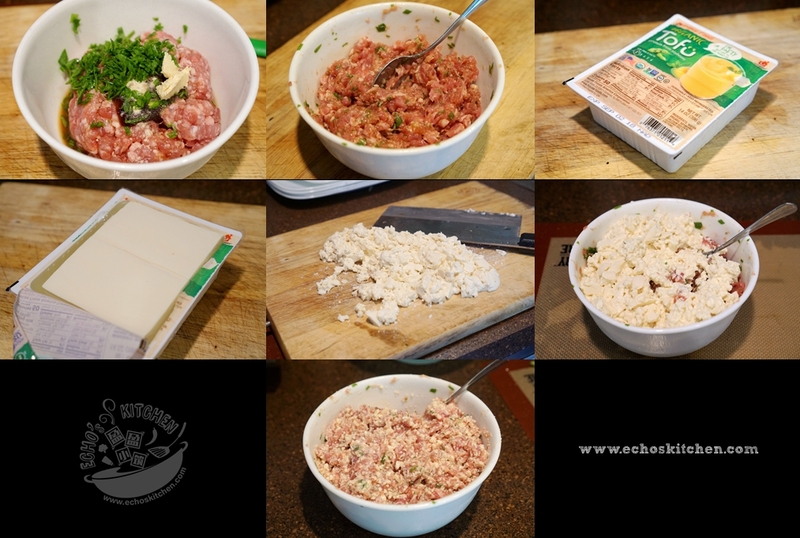 Add the mashed tofu to the minced meat, mix well. 4. 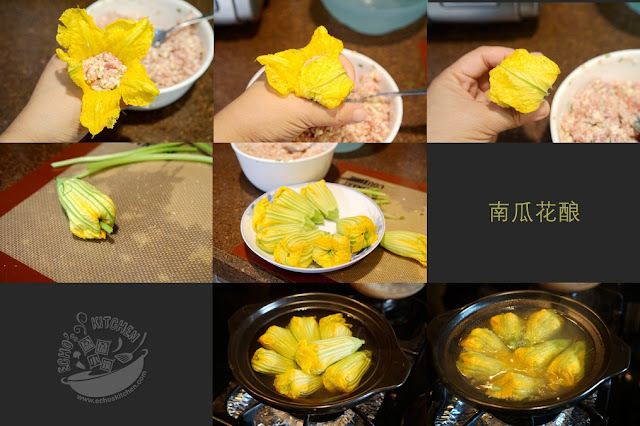 Scope the filling into the pumpkin blossoms and gently twist the petals together to seal, I like to poke one stem in to secure the petals. Repeat the steps to finish stuffing the blossoms. 5. 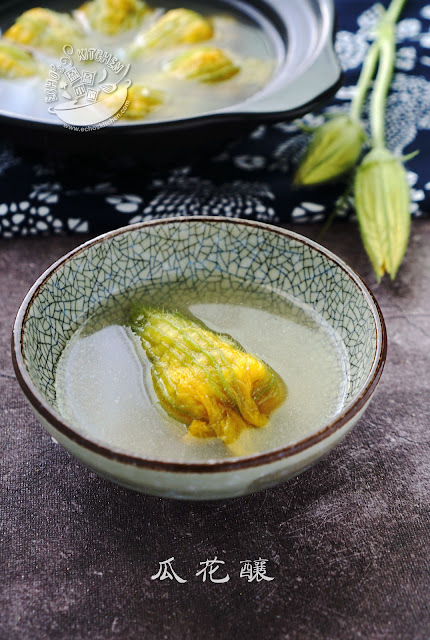 Place the stuffed blossoms in a pot, add 2 cups of chicken stock OR water with some chicken bouillon granules. Cook at medium heat for 10-12 minutes until cooked, season with a little salt and pepper before serving.